Beige, Large - SHIPS FREE! Beige, Medium - SHIPS FREE! Beige, Small - SHIPS FREE! Beige, X-Large - SHIPS FREE! Shape To Fit™ Microfiber Medical Knee-High Stockings are unisex with open-toe design to provide needed support following sclerotherapy and vein ligation. The 20-30 mmHg graduated compression and open-toe makes for easier donning and doffing. The open-toe option is helpful for people who need medical compression support and like to have access to their toes or want to wear sandals or flip flops. Dr. 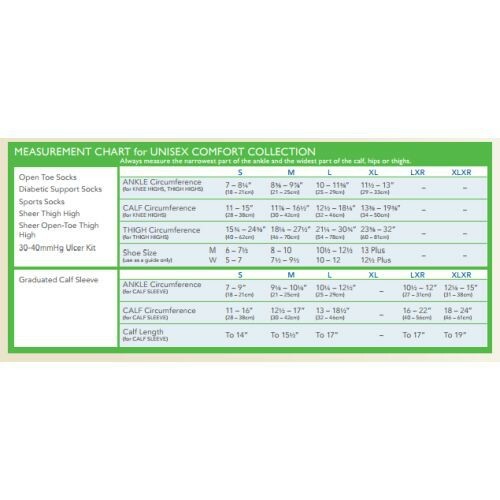 Comfort adds firm 20-30 mmHg compression with soft microfiber material, made with a latex-free blend of nylon with Spandex. The compression promotes healthy blood circulation to reduce swelling after vein ligation. It also reduces leg cramps and leg fatigue. The Microfiber Medical Knee-High Stockings are also available in a closed-toe design.